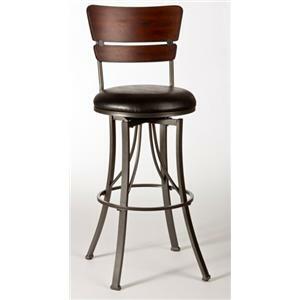 Home Dining Room Furniture Bar Stools Hillsdale Dynamic Designs Barstool 30"
Complement your bar or bistro table with these stylish swivel chairs. The dark black finish and black upholstered seat contribute a very dynamic look to your already attractive home.These stools are bar height, slightly larger than standard counter height chairs, allowing you to sit up high at the table or bar and enjoy your drink. The Dynamic Designs 30 Inch Swivel Bar Stool with Upholstered Seat and Designed Back by Hillsdale at VanDrie Home Furnishings in the Cadillac, Traverse City, Big Rapids, Houghton Lake and Northern Michigan area. Product availability may vary. Contact us for the most current availability on this product. Bring home the amazingly interchangeable Dynamic Designs Collection. 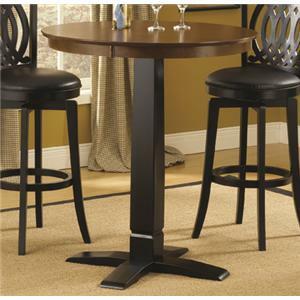 The collection includes the bar height bistro table, which comes with either an all over dark brown finish or a dark brown finished top and black finished base. Switch around bar stools for a different look. 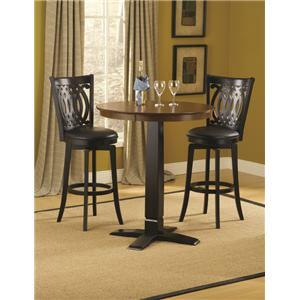 This collection features a 30 inch bar stool with a decorative back. It has a black finish and black upholstered seat, to match the black table base perfectly. Try out these dynamic designs yourself! The Dynamic Designs collection is a great option if you are looking for Contemporary furniture in the Cadillac, Traverse City, Big Rapids, Houghton Lake and Northern Michigan area. Browse other items in the Dynamic Designs collection from VanDrie Home Furnishings in the Cadillac, Traverse City, Big Rapids, Houghton Lake and Northern Michigan area.